Powers/Abilities: Shamrock is possessed by the souls of thousands of victims of wars. The souls manifest themselves as poltergeists which affect probability within a 20-foot radius of Shamrock, altering situations so that she is given an advantage ("good luck"). History: (Marvel Comics Presents#24/3 (fb)) - When Molly was three years old, her father called out to the heavens to grant her brother Paddy the power to strike down his enemies, but there was no immediate result. In Molly's freshman year in college, she discovered that she had obtained a protective aura that altered probability around her. She became the costumed hero Shamrock. (Marvel Super Hero Contest of Champions#1) - Shamrock had just saved a number of schoolchildren from a terrorist's bomb when she was teleported away by the Grandmaster alongside hundreds of other heroes of Earth so that the Grandmaster and Death could choose champions from among them. While the other heroes mingled, Shamrock encountered Captain Britain, and the two took an immediate dislike to each other because of their countries' histories. Shamrock was chosen to serve on Death's team. (Marvel Super Hero Contest of Champions#2 - BTS) - Shamrock was kept aside while the other teams competed for the Golden Globe pieces. (Marvel Super Hero Contest of Champions#3) - Shamrock was teamed with the Collective Man and Storm against Captain America, Blitzkrieg and Sasquatch and sent to South America to compete. 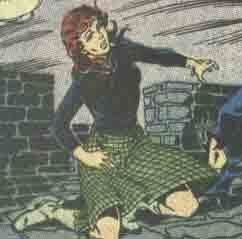 Shamrock sparred with Captain America, managing to evade him at one point when a python appeared in his path. When Blitzkrieg generated an electrical vortex to expose the Globe piece, Shamrock's luck enabled her to reach it first. The Grandmaster won the competition, but had to sacrifice his own life to restore his fallen brother the Collector, and Death returned the participating heroes back home. (Incredible Hulk II#279) - Shamrock was among the throng of heroes who celebrated the Hulk's presidential pardon after he had temporarily regained his intelligence, and remarked: "Tis easy being green!" (Rom#65) - Shamrock joined with other heroes from around the world in aiding Rom against the Dire Wraiths, as the Dire Wraiths were finally driven off Earth. (Marvel Comics Presents I#24/3 (fb) - BTS) - Molly gave up her career as a crimefighter to become a first-grade schoolteacher in Dublin. When she heard from her father that her brother had been killed, she returned to see him. (Marvel Comics Presents I#24/3) - Molly met with her father, but their relationship was still strained because of her refusal to follow his path. He drugged her with some tea, then turned her over to Arnim Zola, hoping that Zola could learn how to duplicate her powers and transfer them to someone else. When Zola probed her, it caused the spirits within her to destroy his machinery, and she managed to destroy Zola's artificial body with a pipe of coolant. Her father tried to shoot her for betraying him, but her powers caused the gun to explode and kill him instead. (All-New Official Handbook of the Marvel Universe Update#3) - Shamrock occasionally dated Peregrine and teamed up with him against the criminal organization ICON. (Alpha Flight I#108) - Shamrock represented Ireland in the first Pan-European Conference on Super-Human Affairs, which was crashed by Brain Drain. Brain Drain attempted to mind-control Shamrock into killing Ireland's president, but her luck power made her immune to his powers. When Northstar of Alpha Flight arrived, expecting to find her under Brain Drain's control, they sat down for some tea instead. (Excalibur I#108 (fb) - BTS) - Molly slipped in the washroom and broke her left foot. Convinced that her luck had run out, she retired the Shamrock identity and devoted herself to her career as a hairdresser. (Excalibur I#108) - Molly's reputation as "the most sought-after hairdresser in all of Europe" brought her Shadowcat and Wolfsbane of Excalibur as clients. (Marvel Monsters: From the Files of Ulysses Bloodstone and the Monster Hunters (fb)-BTS) - While on a shopping trip to Dublin, Janet Van Dyne (the Wasp) had her hair done by Shamrock. (Girl Comics#2/2 (fb) - BTS) - Molly moved to NYC to open a hair salon for super-heroes there. (Girl Comics#2/2) - Molly put on her old costume, but it just didn't fit anymore. She then returned to her hair saloon to fix the hair of Susan Richards and Patsy Walker. When Felicia Hardy came in with her niece Lou Molly didn't want to do her hair because she lacked the training and only worked with super-powered beings because it was easier for her. Trapster attacked the salon and was after a short scuffle taken out when Felicia's niece hit his glue tank with a blow dryer, damaging it and trapping Trapster in his own glue. Molly then used Trapster's glue gun to give Lou a new hairdo. All of Molly's clients left happy once again. (Fearless Defenders#9) - Molly became the owner of the Luck O'The Irish Pub. One night she had a private party for a few heroes and had the chance to listen to the male heroes' (Cannonball, Hercules, Dr. Strange, Nate Grey, Iron Fist, Venom/Thompson, Werewolf/Russell) stories about their ex and current girlfriends while they waited for them to arrive. Eventually Molly told them to not blame the girls for leaving them. Their exes and current girlfriends (Clea, Elsa Bloodstone, Hippolyta, Misty Knight, Dani Moonstar, Valkyrie), who were currently working together as the Fearless Defenders, punched one of the Pandemonium Axles they were fighting against through the pub's wall and apogolized for being late to the party. (Uncanny Avengers III#28 (fb) - BTS) - While Manhattan was trapped under a Darkforce dome during Hydra's takeover of the United States Molly's bar received some damages. (Uncanny Avengers III#28) - Though it was still getting repairs and some renovations Molly served drinks to Beast and Wonder Man, who were meeting at her bar because she still needed to pay her bills. When the two heroes heard sirens outside they left after thanking Molly for the drinks. Comments: Created by Mark Gruenwald, Bill Mantlo, Steven Grant, John Romita, Jr. and Pablo Marcos. 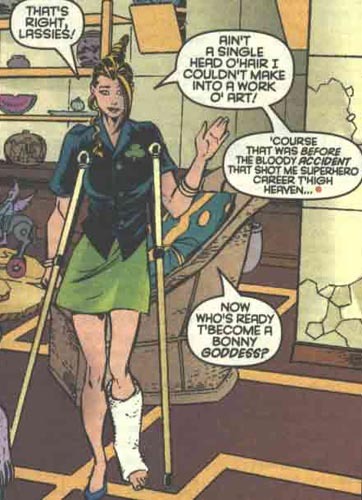 Her father was created by Scott Lobdell, Dennis Jensen and Dan Adkins. Her parents' first names were revealed in Shamrock's profile in All-New OHotMU#9. On Earth-691 her father's first name was revealed as Sean in Guardians of the Galaxy Annual#3. 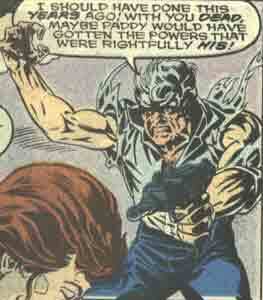 Shamrock was only referred to as Molly Fitzgerald in Excalibur I#108, and that issue's letters page challenged the readers to identify her other identity. They offered an autographed copy of the issue to two winners...are the winners out there somewhere? Jean-Marc Lofficier wrote an unpublished adventure of Shamrock which you can read here. Lofficier's story was mentioned in Peregrine's entry in All-New OHotMU Update#3. In Deadpool: Merc with a Mouth#8, Deadpool, upon encountering Marvel-Zombie-Shamrock, remarks "Shamrock? Been awhile." Since his previous opportunities to encounter MZ-Shamrock would have been few to nil, I think it's safe to presume that he meant it had been a while since he'd encountered Earth-616's Shamrock. Which AFAIK is the first reference to the two ever having encountered each other at all. No clue where such an encounter would fit into Shamrock's history, but FWIW. Since they both fought Arnim Zola (or android facsimiles thereof), maybe they met at an Arnim Zola Defamation League meeting. Bar updates by Markus Raymond. Shamrock's father saw himself as a freedom fighter, and expected his children to follow his way. When Molly was three, he cried out to the heavens to grant his son Paddy the power to strike down his enemies, but the power went to Molly instead. He was resentful to Molly for not using her abilities to fight his fight, and increased in bitterness when Paddy was killed by a terrorist. He struck a bargain with Arnim Zola and had Molly brought to Ireland then drugged her so that Zola could attempt to remove her power and place it into someone loyal to Mr. Fitzgerald. When Molly turned on them, Mr. Fitzgerald tried to shoot her with a gun, but her powers caused the gun to explode and kill him.